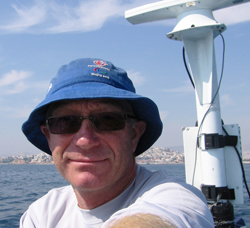 I am a well established sailing coach, mentor, author and sailing journalist. Recently, I was the Team Strategist for the British Sailing Team’s campaign for their highly successful 2016 Games in Rio. Regularly working with the RYA’s Racing Division, I provide coaching for the Podium Development Squad, the High Performance Club programme, as well as Podium sailors on their journey to the Olympic Games. For the previous two Olympiads – Bejing and London 2012, I coached the Paralympic Sonar team, part of the RYA’s then Skandia Team GBR squad. In addition to the RYA, I get involved in many other projects. I have been coaching advisor to Oman Sail’s keelboat programme, I’ve coached and run a successful Tour de France a la Voile team, as well as providing coaching for a wide variety of private clients. In 2007 my first book RYA Tactics was published. The third edition of RYA Tactics is due out in 2017. Meanwhile, I’m working on a new coaching book. Ever since my team racing days I’ve been fascinated by the sailing rules. And over the years have built up my expertise on the racing rules of sailing. I now sit on the RYA Racing Rules Committee: the “law lords” of British sailboat racing! In addition to my on water coaching, I’m part of the RYA’s coaching development team: helping our coaches to develop their technical and coaching skills. In 2014 I completed a professional Mentoring programme with Ashridge Management College. It was fantastic to be working with coaches across a wide range of Olympic sports, many of whom I met again at the 2016 Olympic Games in Rio. As a sailor, I have been successful in a range of classes and won my first championship aged 16, starting in Mirrors sailing with my sister Ruth. I moved into Fireballs and Larks as well as being four times winner of the BUSA Team Racing Championships. More latterly, I’ve been campaigning sportsboats and have recently taken up racing our classic boat with my wife Liz. My early career with Racing Sailboats, Proctor Masts and Hyde Sails gave me extensive experience of boat development, in depth insights into technical spar production and sailmaking as well as marine retailing. “Using my sailing and career background, I aim to offer a wide breath of racing and technical expertise tailored for my clients individual level. I have a passion for learning and sharing knowledge, and originally qualified as a physics teacher. So it seemed natural to turn to coaching when I went freelance in 2002. In 2006 I was honoured to be named RYA Coach of the Year after coaching the RYA Skandia Team GBR Paralympic Sonar Team to two successive World Championship titles. A brief summary of my sailing results.